Nothing quite beats coming home to a couch covered in soft cushions to sink into after a long day at work … and if that doesn’t give you a reason to purchase plenty of pillows then do it for the sake of livening up your living room. Instead of redesigning an entire home with a new pricey sofa set or a collection of coffee tables, cushions are a lot more interchangeable and more affordable pieces of décor that can showcase people’s personality and individuality. The fluffy square, rectangular or circular cushions can either create an invitingly warm ambiance or a cool vibe to any space. According to Jono Fleming, an interior stylist and style editor at the Inside Out platform which teaches design, the latest cushion trends for 2018 are all about being down-to-earth yet bold, embracing styles and patterns and shifting shapes. Marina Homes Interior has just unveiled its latest range of cushion covers, throws, poufs and embroidered stools. The Dubai-based company, which has a store in Bahrain and as far away as Egypt and India, also believes that fabrics are the soul of any room and are a crucial component in defining the character of your space. Its distinctive designs and colourful patterns allow for eclectic mix and matches and don’t forget to create a harmonious fusion with playful elements such as tassels and fringes, tribal motifs and ethnic embellishments. The beauty of the French blush look is its neutral versatility. Bits and pieces of the style can be added into nearly any kind of space including rustic or vintage. Some of these statement Parisian-inspired pieces features washed textures, pastel prints and taupe linens with an overall gorgeous bouquet of dusty pink and cream tones. This series encapsulates the free-spirited, avant-garde lifestyle with funky and vibrant cushions achieved by mixing up weaves, beads, charms and intricate thread work. What a way to cleverly reflect our inner gypsy? This collection features patterns inspired by tribal and ethnic culture and it creates exciting focal areas to the room. This range is all about reconnecting with elements of nature by using organic handmade fabrics made from warm, raw textiles to create a lasting impact with daring tribal motifs. This collection boasts warm earth tones such as sandy yellows, warm browns and deep blues combined with charcoal and ebony. This series features fringes, pom-poms and spirited patterns with a Marrakesh vibe. This muted collection accentuates natural light rendered in cool and warm greys and blues that is reminiscent of colonial nautical tastes. The cushions are even more interesting when layered tone-on-tone in intriguing textured shades of blue. It creates a soothing and inviting ambience. Soften your interior with cool brown neutrals and the result is having a space that’s timelessly welcoming and rustic ready. This range includes earthy neutrals tone-on-tone patterns. 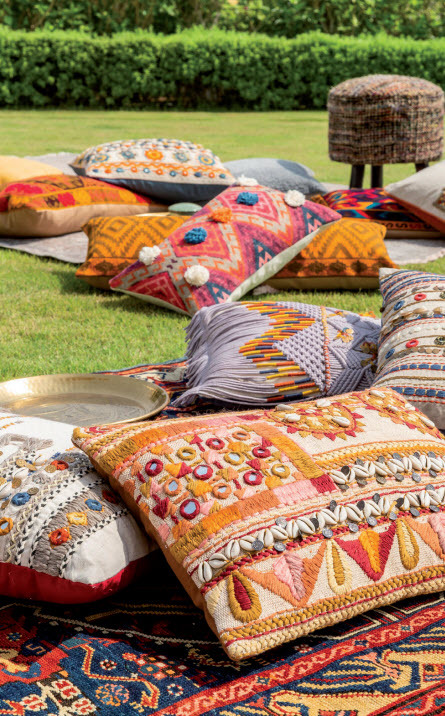 Check out the cushion caravan collection at Marina Home Interiors in Seef Mall.